You don’t have to drag me kicking and screaming from animation, I’ll run with glee. It’s a tedious and painstaking task. Infact I got out before we truly got there. I’m still skipping out of the world of moving parts and swallowing print media whole. And yet it is movies like The Corpse Bride that leave me with that little twinge of, ‘oh to be a part of something like that’ (same goes for Lord of the Rings). I saw it last night, The Corpse Bride and loved it! 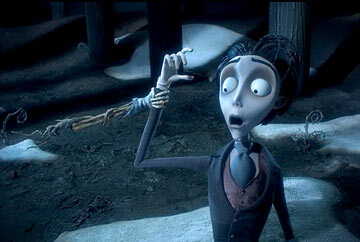 Tim Burton is hideously clever and movie itself is funny, brilliantly directed, animated and shot. It was simply nice to watch an adult cartoon for once without having to contend with your average romantic comedy typicals. Very refreshing. A delightful (in the truest sense of the word) way to spend a bit over an hour. I had a grin smashed to my face the whole time. mmmm, it’s a ripper of a film. Just an insight into what a stylistically motivated director can do when they are given free reign over the entire visual experience. And Danny Elfman’s music is incredible.